Manila the Gates of Hell. From Mr. Lagasca's Facebook page. I don’t like Dan Brown’s books. I once made the unwise decision of reading one. It left me feeling as if I had lost parts of my brain and my intelligence had been stolen. His writing style is bloated and repetitive and his logic is flawed. I vowed never to read any of his novels again for fear I would lose my ability to construct even simple sentences. Recently however, despite my resolve to stay away from Brown’s mental junk food, I felt I had to read two pages of his new book, Inferno. If you haven’t heard the news yet, the current uproar among some residents of Manila is “sponsored” by Brown. Naturally, it was only a matter of time before the Filipinos’ inability to take anything negative kicked in. 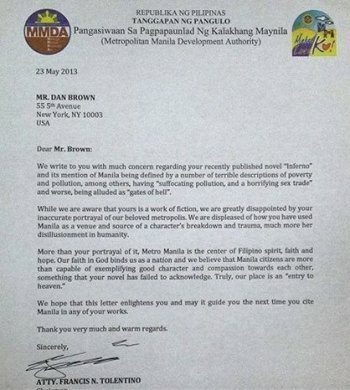 Sure enough, no less than MMDA chief Francis Tolentino expressed in a letter to Brown that he was “greatly disappointed”, arguing that Manila was instead “an entry to heaven”. I find both Brown’s and Tolentino’s metaphors faulty. 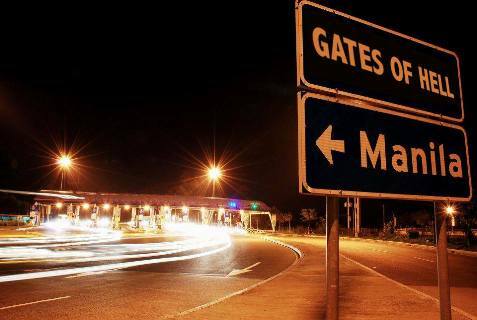 A gate is simply an entry way. If conditions are already awful at the gate, everything must be worse inside. In Manila, what can possibly be worse than what he described? Oh, I know. Perhaps being stuck in a car stuck in traffic with five people farting simultaneously is worse? How about the punishment of life imprisonment in Bilibid with mandatory eight-hour daily readings of Brown’s books? Obviously though, Tolentino’s impression of Manila is more skewed. He needs his eyes, ears and nose checked. He must have lost his senses due to frequent exposure to the streets of Manila. If we were to redefine heaven according to Tolentino, it would be a lot like hell, only better perhaps because our twisted understanding of what is heavenly includes seeing a lot of people going to church and thinking reproductive health is sinful. I’d like to think Manila is neither heaven nor hell. To me, it’s just the armpits of despair, needing truckloads of deodorant and political will to sanitize. Regardless of what anyone thinks though, what’s more important is what we realize. Unless we see Manila for what it truly is, there’s no fixing it. It's not perfect but Manila is Manila and people love to be here for the warmest and most hospitable people you'll ever meet. I like his books though. Hehe ... I think it was blown out of proportion. Tolentino shouldn't have reacted with such letter. The book, after all, is a work of fiction. Anything that's written there should be taken with a grain of salt.